Are you looking for some lost treasure,then go and buy some subdiving equipment and start hunting,dont worry becouse that is UNESCO property you can legally get your share .All you have to do is just to find it. Treasure-Ships, According to UNESCO Convention on the Protection of the Underwater Cultural Heritage, they estimate the ocean floors are littered with about three million shipwrecks. UNESCO is the agency given to determine who owns the valuable cargos of these shipwrecks. In the US costal waters alone there are about 65, 000 sunken ships since the 16th century. Some of these ships carried vast treasures below is just some of the most valuable ones, some found some still to be found. Wrecked in 1511 the Portuguese had a field day when they overran the ancient kingdom of Malacca in present-day Malaysia after its sultan declined a request for permission to trade there. Admiral Alfonso d'Albuquerque's men spent three days sacking the city and relieving it of 60 tons of gold booty plus the sultan's throne - not to mention his ingots and coinage - and more than 200 chests of diamonds, emeralds, rubies, and sapphires. The admiral called it "the richest treasure on earth that I have ever seen," and loaded it aboard the Flor do Mar. The Portuguese didn't get far with it, though; she went down in a storm off the northern coast of Sumatra along with riches estimated to be worth $1.7 to $3 billion. 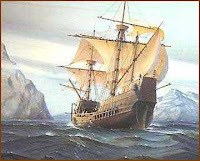 The San José is c onsidered to be the richest treasure ships ever lost in the Western Hemisphere. She sank in about 1,000 feet of water on June 8th, 1708. This loss resulted from a battle with an English squadron. Due to the ongoing War of the Spanish Succession, no treasure had been sent from South America to Spain for a period of six years. English Commodore Charles Wager tracked down the treasure-laden ship 16 miles off Cartagena and sunk it in 1000 feet of water. The San José was loaded with eleven million pesos (about 344 tons of gold and silver coins). 116 chests of emeralds, and the personal wealth of the Viceroy of Peru. In the Battle of Tsushima, a decisive fight of the 1904-05 Russo-Japanese War, wh ich saw the cruiser Admiral Nakhimov destroyed in 1905 she went down along with most of the Russian fleet -- scuttled, actually, after being struck by a Japanese torpedo in the straits between Korea and Japan. The Admiral would be a mere footnote to history had she not putatively been the paymaster to the fleet and carrying more than 5,000 boxes of gold coins and ingots worth an estimated $32 billion. Also went down in the same battle: she was reputedly carrying gold worth $124 billion. Both ships are not confirmed by the Russians as carrying any gold at all so maybe it is just a story. But the value of these cargoes keep people looking. Sunk on J une 13th 1594. The Portuguese carrack (merchant ship) Las Cinque Chagas was returning home from the East Indies in June of 1594 bulging with treasure that included bounty rescued from two other wrecked ships. 3,500,000 cruzadoes, plus an unknown number of chests of diamonds, rubies and pearls. The overloaded vessel sailed into the Azores to replenish stocks, pulled out the next day, and came under protracted attack by four English warships. She went down in deep waters about 18 miles south of the channel between Pico and Fayal, in the Azores. The riches that sank with her is believed to have been thousands of tons of the richest cargo (including diamonds, rubies, and pearls) ever to leave an Asian port. Reputed value more than 1 Billion US Dollars. Seized in 1579 After the globetrotting Francis Drake used subterfuge (setting a dilly- dallying pace so as not to betray hostile motives) to capture the Spanish galleon Cacafuego off the coast of Ecuador. Drake hauled aboard enough gold and silver to enable Queen Elizabeth I to pay off England's national debt. Exact figures were hushed up, but the take supposedly included 80 pounds of gold, 20 tons of silver, 13 cases of silver coins, and cases full of pearls and precious stones. Wrecked in 1 799. It isn't always deep water that keeps shipwrecked treasure hidden. The British frigate Lutine was carrying 1,000 bars of gold and 500 bars of silver from London to Hamburg in 1799 when she went down in a gale the sandbank covered waters between the islands of Vlieland and Terschelling in Holland's West Frisian Islands, her cargo swallowed by the eternally shifting sand banks that have digested thousands of other ships. A few gold and silver bars were salvaged, and the ship's bell was recovered in 1858; the rest of the buried riches are estimated to be worth some $30 million dollars today. The Lloyd's of London insurance payout was the largest ever at the time. Wrecked in 1755 . When the French West Indies merchant ship Notre Dame de Deliverance departed Havana in October 1755, she was packed with 1,200 pounds of gold bullio n, 15,000 gold doubloons, six chests of gems, and more than a million silver pieces. The vessel was chartered by Spain to haul treasures from mines in Mexico, Peru, and Columbia. A hurricane sent her to her fate about 40 miles off the coast of Key West. A Florida court awarded salvage rights to a team of American treasure hunters, who believe they have located the ship-and estimate its worth at between $2 billion and $3 billion. The Whydah , bearing 28 cannons and skippered by pirate "Black Sam" Bellamy, was loaded with booty from more than 50 ships when she went down in a howling nor'easter off Cape Cod in 1718. A reported summary of the ship's contents includes 50,000 pounds sterling in coin, gold and silver bars, a large ruby, several emerald-studded crosses, and several hundred gold and silver "biscuit ingots." Barry Clifford located the wreck in 1984, and has found thousands of coins and pieces of rare African gold jewelry, but according to Clifford's colleague, historian Ken Kinkor, the ship's mother lode remains untouched: a large ornate iron box trapped beneath 15 cannons, only discovered last summer. 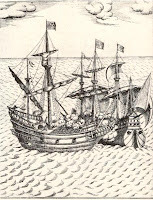 A 250-ton Spanish galleon by the name of La Madalena commanded by Captain Cristobel Rodriquez was headed back to Spain after visiting Vercruz, Mexico and Havana in 1563. A bad storm tossed the small boat around and finally sank the galleon. There were 300 people aboard and only 16 survived the storm. In 1726, San ta Rosa, a Portuguese ship, carrying 26 tons of registered gold bullion and coins she had picked up in Salvador, caught fire and blew up off the coast of Brazil. Weighed down by more than five tons of gold, the galleon Santa Rosa, the mightiest ship in colonial Portugal's fleet, set sail for Europe from the Brazilian port of Salvador in late August 1726. But on Sept. 6, just as the ship passed Recife, the gunpowder in its hold blew up and it sank, killing all but seven of the 700 men, women and children aboard. The explosion probably was an accident, but it could have been sabotage. No one knows for sure. This ship is actively being searched for by Odyssey Marine. In 1636, the Santa Catalina, only a few miles from her destination of Lisbon, Portugal, went down due to faulty navigation. She carried more than 3,500,000 cruzadoes in gold coin plus 22 chests of diamonds, rubies, and other precious stones. In 1616, Santissima Trinidad, a Spanish Manila Galleon, on her way to Acapulco, went down in a typhoon, somewhere around the Osumi Strait, off the southern extremity of Japan. Her cargo is estimated to have been 3,000,000 pesos (94 tons of coins). In 1656, the San Francisco Xavier was lost in Spain's Bay of Cadiz. After battling with an English squadron, she made for port and just before reaching her destination, blew up. She went down with more than 2,000,000 pesos (63 tons of coins). The Verelst is considered to be the richest treasure ship ever lost by the Dutch. She was dashed to pieces in 1771 on a barrier reef near a fishing village known as Grand Gaube, on Mauritius Island in the Indian Ocean. In addition to a cargo of more than 2,000,000 gold florins (weight unknown), she was known to have carried 740 pounds of diamonds in seventeen bound chests (considered to be one of the largest quantity of diamonds ever lost in any wreck). One of the diamonds was alleged to be the size of a man's fist and if true, would be the largest such stone ever to be discovered anywhere in the world. She was found a few years ago but nothing of her great treasure was recovered. 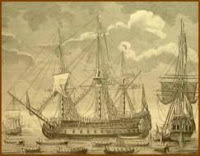 The Grosvenor is considered to be the richest British East Indiaman ship ever lost. It wrecked on a reef August 4th, 1782, broke apart and sank on a deserted coast known as Pondoland, north of Port St. John, about 700 miles northeast of Cape Town, South Africa. The loss included 2,600,000 gold Pagoda coins (weight unknown), 1,400 gold ingots (weight unknown), nineteen chests of diamonds, emeralds, rubies and sapphires and an extremely valuable jewel encrusted gold peacock throne from India. Many have tried to find the treasure, and the ship is claimed to have been found, on a very inhospitable part of the coast. But the treasure is still to be located. The Spanish ship Santa Maria de Finisterra, while at anchor in Havana harbor on January 7th, 1552, sank with no apparent reason. It had been loaded with more than 2,000,000 pesos (63 tons of coins). This ship was probably salvaged at the time. In 1730, the rich ly laden Spanish ship Genovesa sank about 100 miles southwest of Kingston, Jamaica, in the Pedro Banks. The specific area in which it perished is also called "The Viper" because many ships perished there. A sack with 4 gold pieces which formed one whole gold bar, two half bars and a small piece, all four weigh 24 lbs. 10 ounces, which according to English weights has a value of 4.768 pesos. - In the same sack: 330 pesos and 6 reales, 192 of these in doubloons. Admiralty Corporation are searching for this shipwreck. In 1588, to avoid losing their treasure in a battle with Dutch warships, 24 Spanish Galleons entered Matanzas Bay, Cuba, in an attempt to unload their rich cargoes. They were not fast enough. Without firing a shot, the Dutch grabbed more than 25,000,000 pesos. There was so much treasure that they had to re-float 4 of the Spanish ships to carry off their plunder. Although considered to be the greatest treasure ever captured. The Dutch could have seized twice as much as they took (781 tons of precious metals) had they known that the Spanish had concealed huge amounts of gold and precious stones under the ballast of their ships. As a result, Piet Heyn, the Dutch commander, had his men burn twenty galleons, sending them all to the bottom of Matanzas Bay where they still remain today. Sank on Anegada in 1738 with the loss of all her cargo. She was carrying on board treasure to the value of $1,750,000.00 which if multiplied with inflation would represent a vast sum today. There was no recorded salvage of this ship and to the best of anybody’s knowledge, the vessel is still lying on the bottom with her cargo intact. HALIFAX, Nova Scotia: Wednesday, June 13th, 2006 - - For the past two centuries, the tunnels of Nova Scotia’s Oak Island have piqued the imagination of historians and treasure hunters alike. Now, a new theory by First Nations researcher Keith Ranville may add fresh speculation to the mystery. Based on a unique reading of an inscription once found in the “Money Pit,” Mr. Ranville believes that the answer to the riddle may be found on nearby Birch Island. Santa Catalina, found and receovered in 2007. When are you going to realise that the entrance to the underground "limestone" cave system is on the mainland??? Look for a hidden cave entrance walk down the tunnel and collect the damn chests! Gee why cant anyone see this? ?